Zenith Gallery in downtown DC, the Zenith Community Arts Foundation (ZCAF) and the Capital Area Food Bank (CAFB) redefine the term “great taste” by bringing art, food, and charity together in the second iteration of "Food Glorious Food." Details here. Tickets for the November 10th reception, 6 - 10pm: Couple $90 Individual: $50. Proceeds to benefit the Capital Area Food Bank. Reception: Friday, November 10th, 6 - 10pm. Show Dates: November 10th – December 3rd, 2006. Even the most stubborn deal scrounger probably would have been satisfied with the rate of return recently offered to her for a curiosity she snagged for $5 in a San Bernardino thrift shop in the early 1990s. A buyer, said to be from Saudi Arabia, was willing to pay $9 million for it, just under an 180 million percent increase on her original investment. Ms. Horton, a sandpaper-voiced woman with a hard-shell perm who lives in a mobile home in Costa Mesa and depends on her Social Security checks, turned him down without a second thought. Ms. Horton’s find is not exactly the kind that gets pulled from a steamer trunk on the “Antiques Roadshow.” It is a dinner-table-size painting, crosshatched in the unmistakable drippy, streaky, swirly style that made Jackson Pollock one of the most famous artists of the last century. Ms. Horton had never heard of Pollock before buying the painting, but when an art teacher saw it and told her that it might be his work (and that it could fetch untold millions if it were), she launched herself on a single-minded post-retirement career — enlisting, along the way, a forensic expert and a once-powerful art dealer — to have her painting acknowledged as authentic by scholars and the art market. The movie, directed by Harry Moses, a veteran television documentarian, was produced by him; Don Hewitt, the creator and former executive producer of "60 Minutes"; and his son, Steven Hewitt, a former top executive at Showtime. Mr. Moses said he first became aware of Ms. Horton’s quest when he was approached by Tod Volpe, a high-flying art dealer who fell to earth, and landed himself in prison, in the late 1990s for defrauding several of his celebrity clients, including Jack Nicholson and Barbra Streisand. Mr. Volpe, who has harbored dreams of breaking into movies, proposed collaborating with Mr. Moses on a 10-hour documentary mini-series about corruption in the art world, a subject he said he knew well. It gets better! "It became, really, a story about class in America," Mr. Moses said. "It’s a story of the art world looking down its collective nose at this woman with an eighth-grade education." Hoving, in spite of his "False Impressions" book, as far as I know, is not a Pollock-specific expert. And that counts. Although a Rembrandt expert could probably have an educated opinion, after some real examination, if a Vermeer painting stands a chance of being a real Vermeer, only an experienced Vermeer expert, armed with some forensic tools, can make a semi-final determination about a suspected Vermeer being real real or fake. And "experts" are wrong all the time! Remember this "fake" Vermeer? The only thing that the best of experts can determine quickly by examining a drip painting close-up is to verify that it is indeed a drip oil painting (as opposed to a reproduction, or a flatter watercolor, etc.). An expert with an open mind would have turned the painting around, and examined the back of the painting to see if the canvas was stretched like Pollock canvasses, if the nails or the staples used to anchor the canvas were the same that Pollock used, if the type of canvas was the same type (or brand, or weave) that was used in real Pollock paintings, if the canvas was stapled/nailed on the side or on the back (artists are creatures of habit, and Pollock probably did it the same way all through his life), if these nails or staples has the same aged appearance that a decades old painting should have, are the sides of the painting "painted" or left virgin?, is the canvas primed or raw?, etc. In other words, no real open-minded expert just looks at a painting (which is so closely visually similar to Pollock's work - at first sight) and makes a haughty judgement like that. 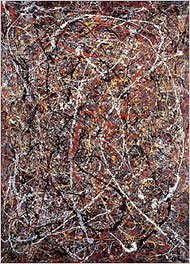 And then science takes over to verify the work, looking for other scientific consistensies (or lack thereof) between this $5 Pollock and the multi-million dollar ones. Hoving may have been a decent and flamboyant Met director, but he's dangerously approaching being labeled a hack as an "expert" if he claims to be able to determine a painting's validity with a quick glance. Read the whole article here and then read Bailey's take on the whole subject and his offer to Ms. Horton here. Original Digital Images Wanted for Art Walk Project. The DC Commission on the Arts and Humanities is seeking 12 artists to take part in a thought provoking large-scale outdoor exhibit entitled "Drift", for the next phase of the Art Walk Project. The Art Walk is located along 10th Street, NW between New York Avenue and H Street at the former site of the Old Convention Center which is now a parking facility. Artists are asked to submit original digital images based on the theme DRIFT to be considered for reproduction on 7 ft. by 24 ft. banners. To apply visit this website or call (202) 724-5613.